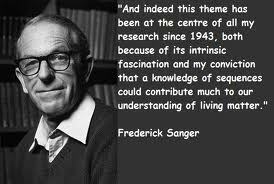 Frederick Sanger is known for determining the structure of the hormone insulin, for his success in identifying nucleic acid sequences, and for the methods he has developed to conduct laboratory processes. In 1958, Sanger was honored with the Nobel Prize in chemistry for his work with insulin and other proteins. The honor was repeated in 1980 when he received a second Nobel Prize in chemistry for his research into nucleic acid sequencing. Born in Rendcombe, Gloucestershire, England, Sanger followed in his father's footsteps to become a doctor. His area of interest, however, was not running a medical practice, but research. Sanger's experience as a self-described "above-average, but not outstanding student" in preparatory school and college belied his future accomplishments. He received his doctorate from Cambridge University in 1943. Sanger joined the laboratory of Albert Chibnall at Cambridge. Chibnall's group had previously determined which amino acids made up insulin, and Sanger's work on the structure of insulin and other proteins was an extension of Chibnall's research. Sanger's first work was identifying the amino acid sequences of proteins by using a chemical that forms compounds with the acids and marks each with a different color. This chemical, 2,4-dinitrofluorobenzene, is now called Sanger's reagent. He used this same method to determine the sequences of various protein fragments. The insulin molecule is composed of two polypeptides or amino acid chains linked in two places by sulfur bridges. Sanger discovered that the two chains could be separated by chemically breaking the sulfur bridges. The phenylalanyl or B chain is the more basic and insoluble of the two, he found. He used the new method of paper chromatography to separate the different but closely related fragments. In this method the fragments move different distances over wet filter paper, coming to rest at different places. Sanger then analyzed each fragment individually. For the glycyl or A chain, which is more acidic and soluble, he used another new method, electrophoresis, in which the chain fragments move through a fluid at different speeds in response to an electrical current, depending on their characteristics and those of the fluid. He determined the amino acid sequence for each fragment, noting any common groupings. From this he compiled the entire sequence of 21 amino acids for the A chain and 30 for the B chain, connected by two sulfur bonds. Sanger next adapted his protein methods to identifying the sequences of bases (nucleotides) in the nucleic acids RNA and DNA, the molecules that carry the genetic code of all living things. Combining electrophoresis, radioactive tagging, x-ray photography and his own procedures, he developed several complex sequencing techniques. Sanger's work with nucleic acids was independently complemented by that of the American chemist Walter Gilbert, who shared the 1980 Nobel chemistry prize. Sanger's methods are considered more efficient for long chains, while Gilbert's method is preferred for short segments. Together they laid the foundation for modern genetic engineering and large-scale sequencing projects such as that which will map the human genome. In addition to his two Nobel prizes, Sanger has been recognized by such honors as the Corday-Morgan Medal and the Prize of the Chemical Society, and by memberships in organizations such as the Royal Society, the American Academy of Arts and Sciences, and the American Society of Biological Chemists. Britain's Sanger Center, a research organization dedicated to mapping and sequencing the human genome, was named in his honor.